ATA PUBLIC MEETING - ATA HQ Friday April 26 2019 - 2:00 p.m.
ATA PUBLIC MEETING - Friday April 26 2019 - 2:00 p.m. 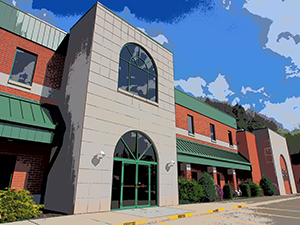 The Area Transportation Authority is seeking a qualified individual to fill the position of Customer Service Representative at its regional facility located at 44 Transportation Center, Johnsonburg, PA. The successful applicant must possess strong communication skills including the ability to demonstrate excellent listening and critical expository skills. Proficiency in the use of Microsoft Office Suite is preferred. A Bachelor’s Degree in Business Administration, Marketing, or Communications is required. In addition to the educational requirement, two years working experience in public relations or marketing is preferred. Applicants must possess a current valid Pennsylvania driver’s license. Interested applicants can submit their resume to the Area Transportation Authority, 44 Transportation Center, Johnsonburg, PA 15845. Resumes will be accepted until FRIDAY APRIL 26, 2019. The Area Transportation Authority is actively seeking minority and/or female applicants and is an Equal Opportunity Employer. CLICK HERE for a PDF file MAIL-IN APPLICATION. Apply no later than FRIDAY APRIL 26, 2019. The Area Transportation Authority is actively seeking minority and/or female applicants. 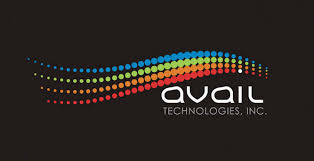 (ATA) is an Equal Employment Opportunity Employer. ATA has a full-time temporary paid Accounting Intern position open from Mid-May through Mid-August, 2019. Applicants should have at least a junior status in a four-year Accounting program and would be responsible for some of the duties related specifically to accounting and transit. These duties include; working with farebox revenue, accounts payable data entry, operating statistics, and other duties as assigned. Applicant should have basic knowledge of Microsoft Office Products, Excel spreadsheet data entry and manipulation, capacity to learn new software and should be able to lift 25 pounds. Please submit your cover letter and resume to: Human Resource Manager, Area Transportation Authority, 44 Transportation Center, Johnsonburg, PA 15845. ATA is an Equal Employment Opportunity Employer. 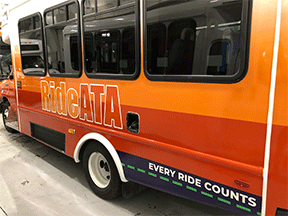 “Every Ride Counts” is the name of a nationwide awareness program from the National Aging and Disability Transportation Center (NADTC). The program was launched in December 2018 along with the release of a comprehensive transportation survey of older adults, people with disabilities and caregivers. ATA participated in the launch of “every ride counts” during a news conference held at the National Press Club in Washington, DC on December 7th. NADTC is funded by the Federal Transit Administration. It is administered by the National Association of Area Agencies on Aging and Easterseals, with guidance from the Administration for Community Living of the Department of Health and Human Services. 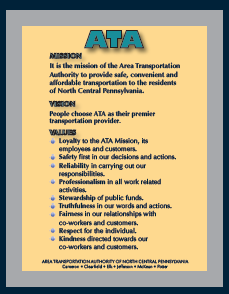 NADTC offers training and support to service providers and transportation agencies like ATA. The mission of NADTC is to assure that older adults, people with disabilities and caregivers are aware of how local transportation options can help them get where they need to go. ATA has already distributed nearly 1,000 copies of a publication from NADTC called “Before You Give Up the Keys”. 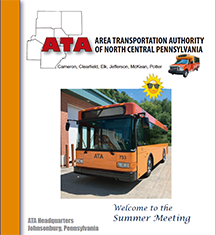 ATA has made this “planner” booklet available free of charge. 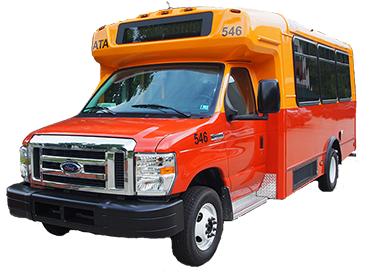 Brand new - ATA Bus 550 will soon join the fleet. “Every Ride Counts” national transportation awareness campaign. The NADTC booklet with personal “needs checklist” card, was developed to help people 65-plus in three important steps – “learn, prepare and act” – so that when the decision is made to give up the keys, seniors will already have a roadmap to guide them to full mobility. 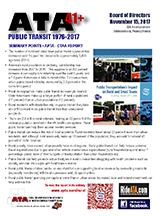 Have you tried ATA transit? ATA says that its new riders are often surprised how easy it is. Call ATA customer service 1-866-282-4968 to request a free copy of “Before You Give Up the Keys”. 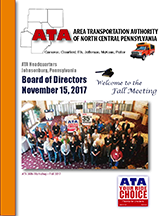 ATA is a six county regional transportation authority with headquarters in Johnsonburg PA, support facilities in Bradford and DuBois and transit centers operating in St. Marys and Punxsutawney. The Fall board meeting was held on November 15, 2017.